It’s been 17 years since I said, “I do.” And on that special day when I agreed to stay with my lover and companion, I also began to study my husband. Why? I’m so glad you asked. I am not exaggerating when I say our marriage has bloomed and grown so much deeper than our first few years. It has become a wonderful reality that staying married has its perks. Just this month my love dug even deeper than I thought possible for that amazing, bearded man with the blue-gray eyes. You see I faced a difficult trial in my life that drove me to tears of frustration, and even lots of question about my future. But you know what? My husband was right there — encouraging me, holding me when he knew the tears may come and doing everything in his power to help our family keep going strong. So yes, when I watched him show his selfless love to me this week through days and days of difficulties, my love and respect grew for that man. When I told him how much my love had grown this past month, he had the cutest response. “Ditto,” is the message he wrote me on Facebook. Yes, I know it’s pitiful that we message each other in the same house, but it’s much easier than running up and down the stairs — wink, wink! I began to think why would this man love me so much? Why would his love be growing for me? I’m sure he chooses to love me because he knows it is what God commands him to do. But, on the other hand, I don’t think he is obeying God’s command reluctantly — but rather enjoys loving me. Since my husband and I were married 17 years ago I have made notes of the little things he loves. You know…like which candy bar is his favorite? If he could only eat one meal on earth, what would it be? I also noted things that irritated them, and avoided them — well, sometimes. I’m kind of sneaky and playful with him and have been known to tickle him on his sides or pull a prank or two. But, I know when enough is enough. But my husband began to notice that I was studying him — and he liked it. In fact, it made him love me even more. And honestly, it’s easy to love someone who desires to please you, isn’t it? I know some women are angered that I study my husband, but really — it is my choice. I choose to study him because I love him and I want to please him in every way I can. If I know he likes a certain color on me, I wear it. If I know he loves homemade french fries at night with cheddar cheese on top, I just might surprise him with a small plate at 9 pm. 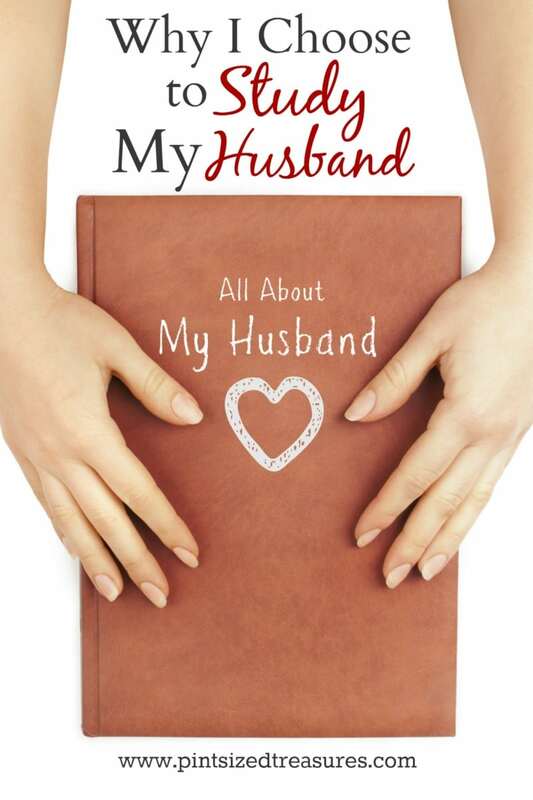 Have you ever thought of studying your husband? It’s really fun — and it helps you connect with him on a deeper level. I feel like I understand him and know him so much better when I began to make mental notes of his likes and dislikes. And, I think our entire family gains much happiness when I know how my husband works. I can predict if he wants quiet, or wants to go out for a date, or wants an extra snack. It’s almost super-weird now how much we understand each other. So weird, that we finish each other sentences all the time or we just have to give each other one look and we communicate clearly. Yes, there are definite perks to studying your husband! What about you? Do you think you’re a good student of your husband? Let’s find out! Answer the questions below to see if you need to brush up on your husbandology or not! 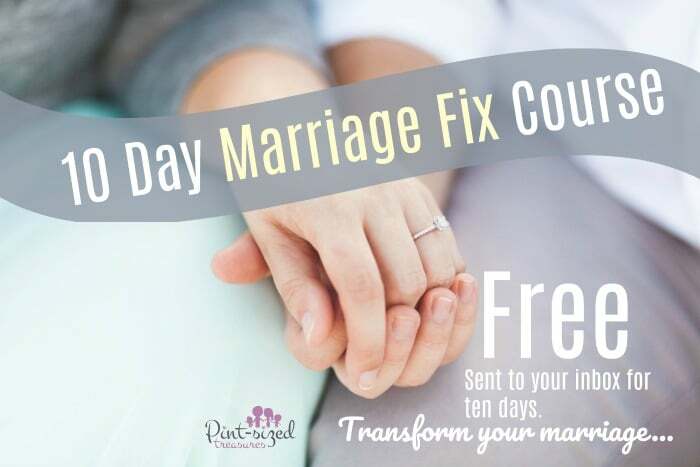 But before you begin, I want to tell you about a 10 Day, Completely FREE Marriage Fix course that will be delivered straight to your inbox! It’s ten days of marriage changing, love-igniting encouragement that is candid, honest and heart-felt. I want to see your family enjoy a strong, powerful, close-knit and passionate marriage. Give me ten days to give you the best marriage help we have available. And you can reply to any and every email with any questions or suggestions! What’s your husband’s favorite dessert? What is his favorite drink? Right now, if someone gave him $1,000, what would he buy? What specific area in his life does he desire the most prayer? When he comes home from work, what pleases him more: a meticulously clean home, a delicious homemade meal or a quiet and calm atmosphere? Is your husband a steady guy, a visionary guy or a commanding, domineering guy? What outfit does your husband love to see on you the most? What perfume or lotion does your husband like you to wear? How much time does your husband want with you on a daily basis? What does the perfect vacation look like to your husband? How many questions could you answer? If not that many, then why not ask him or start paying attention to some of those things listed above. If you take time to study your husband, you will learn how he ticks, and you can create beautiful music together — instead of screeching and inharmonious tones. Let me share a quick story with you. She continued to encourage the women. These statements revived me during that time, as I had four small kids and lived on the road with my family. I needed some fresh, inspiring ideas for my marriage, and in those few comments and suggestions I found them. I learned that some things are not super important to my husband, but other things, like home-schooling, are on his “top ten” priorities list. Now, if you choose to study your husband, just prepare for backlash — and lots of it. Most people today believe that life should revolve around women — really. It’s all about “empowering women.” But, let’s be honest. If I told you my husband made notes of what I loved, liked and disliked you would think that was super-sweet and admirable, wouldn’t you? So why not see the beauty in a wife who studies her husband? You see the inconsistency here? Why is it romantic when a husband does thoughtful things and is consumed with pleasing his wife, but a woman is becoming a mindless doormat when she desires to be a good student of her husband? It truly baffles me the silly notions and lies the pervade homes and families today. Keep your marriage alive and well by taking care to remember things that are important to your husband. You and him will reap a deep and loving relationship if you choose to learn, study and truly know each other. You’re on this journey of life together!